Here's an offer to go quakers over! 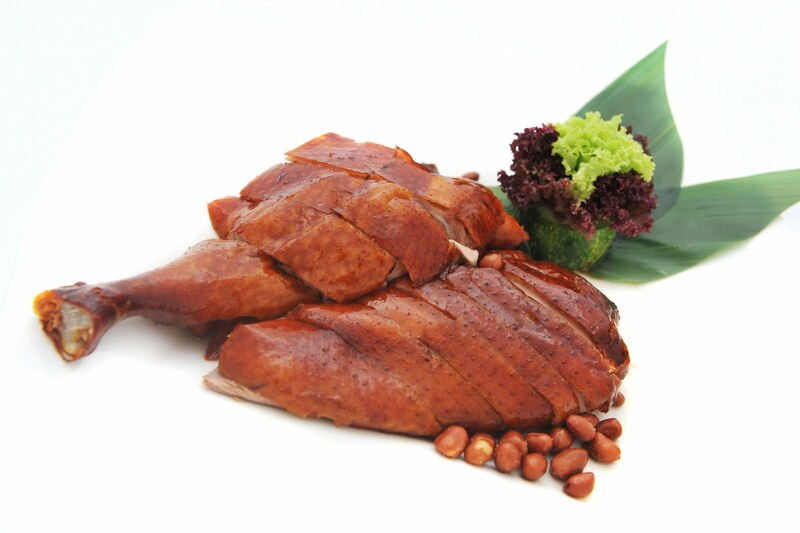 Zing at Grand Millennim Kuala Lumpur is giving away half a roast duck to every table of four persons and a whole roast duck to every table of eight persons this March and April. According to outlet manager June Kong, the freebie is a form of reward to loyal customers who lunch or dine at Zing. Look out for more complimentary dishes that will be offered on a bi-monthly basis - a mouth-watering way to tempt diners to sample the restaurant's house specialities! Since I'm not residing in Subang Jaya, I find it's fascinating that the suburb should have so many Japanese restaurants tucked within the vicinity that stretches between SS12 and SS15. 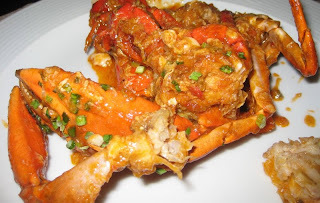 We dined at two recently and both serve better than average Japanese fare much to our delight. In fact, this review is on Yamada - a small eatery that obviously is named its owner-chef who looks like he's got a wealth of experience behind him. The blond wood-clad interior was tastefully decorated with lovely Japanese paintings and outfitted with a long sushi bar. Feeling adventurous, hubby and I decided to bypass the set dinner menu and ordered some distinctly Japanese dishes for sampling. As luck would have it, our choices turned out to be really good too! 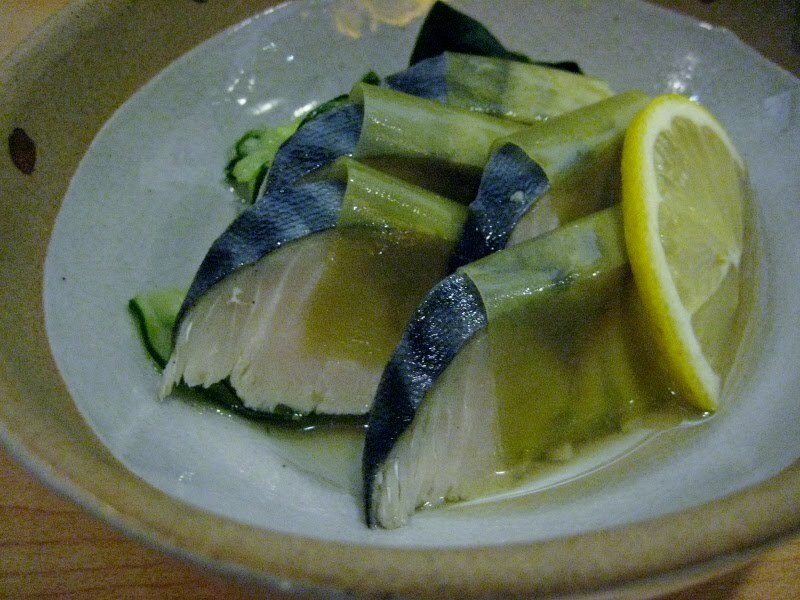 Hubby's first pick of Vinegared Mackerel was a tantalising curtain-raiser; slices of super-fresh and firm mackerel wrapped in a translucent layer of pickled leek. The fish's inherent richness was aptly tempered by a lip-puckering but pleasant vinegary tartness whilst raggedy strips of wakame (kelp) and paper-thin slices of cucumber lent their textural contrasts. His next choice of Sweet Shrimps were equally sublime. 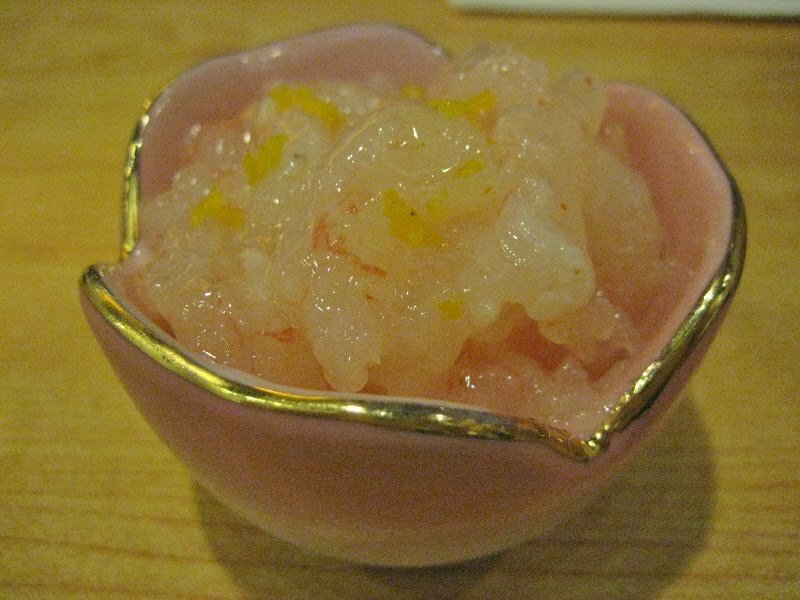 Served sashimi-style, the tiny pink shrimps were sugary sweet and springy to the bite with unexpected bursts of citrusy nuance and fragrance coming from the fine yuzu zest that was sprinkled on top. 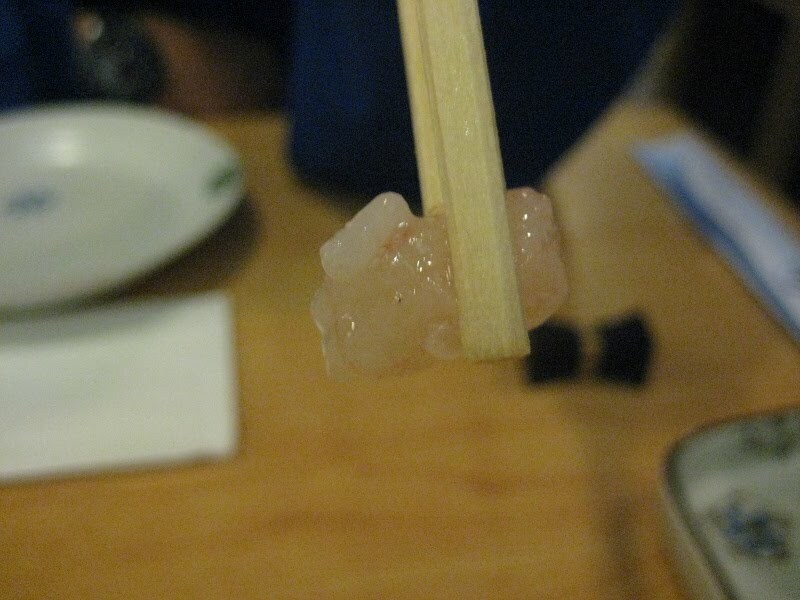 We also found tiny pearls of glutinous rice amongst them and wondered if this had contributed to the delicate sweetness. I couldn't recall when I became enamoured with Oden but I've always kept an eye out for this speciality whenever I dine out at any Japanese eatery. 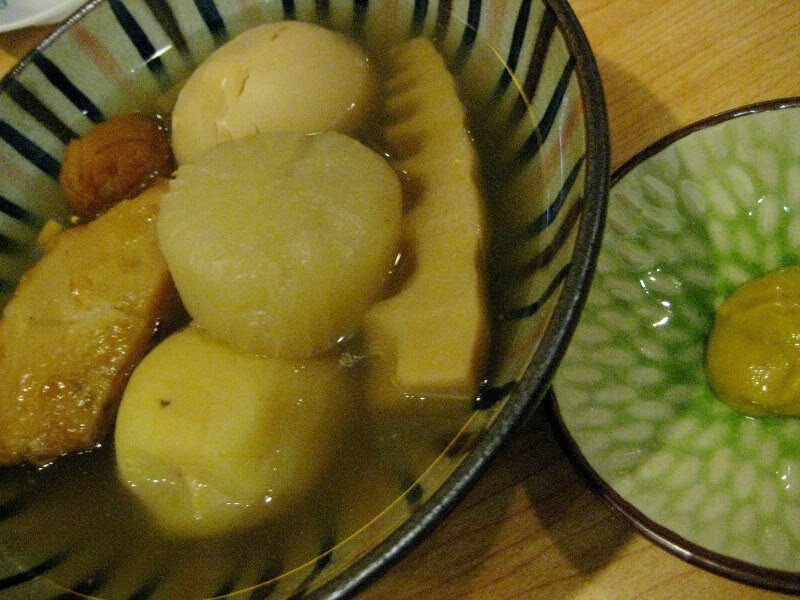 Similar to our local yong tau foo, Yamada's version comprises a piece of thickly sliced radish, a wedge of bamboo shoot, a triangular slab of ita konnyaku, a bouncy fish ball, a fried fish cake patty, a whole boiled potato and a hard-boiled egg. We found the different offerings acquired a tantalising zing when eaten with some Japanese horseradish. The only snag here was the overly salty broth which took some getting used to. Our order of Kushiyaki was top-notch. 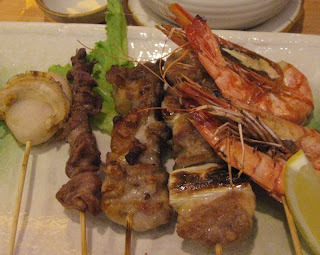 I went for 5 sticks: a whole scallop, chicken gizzard, boneless chicken drumstick meat, chicken meat with inch-long scallion pieces and prawns. Grilled with a sprinkling of shio (salt) and enhanced with a squeeze of lemon juice, we thoroughly relished each skewer for its splendid texture and natural flavour. Ever since our favourite Japanese restaurant in the heart of KL closed down some years ago, hubby has been yearning for good Inaniwa Noodles. Past encounters have yet to come up to scratch and this time, it was no different. 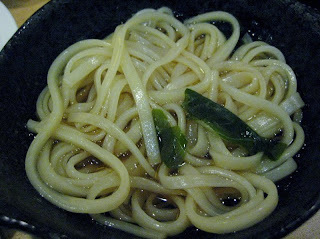 These fine wheat noodles which are akin to mee suah boast a fine, smooth texture and is served plain in a delicately flavoured broth. While the bowlful we sampled at Yamada was not too bad, it wasn't something to write home about either. Still, we'd probably return to Yamada as the menu has scores of other intriguing dishes that we'd like to try. The restaurant was packed with Japanese expats and some locals the evening we went; in fact we were lucky to get a table since we happened to be the early birds! Fancy feasting on Chilli Crabs, Yee Sang, Smoked Salmon, Poached Seafood and an indulgent array of Japanese, Indian, Italian and Asian specialities this Chinese New Year? 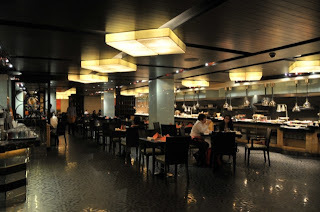 Then hop right into the Grand Millennium Kuala Lumpur (GMKL) and eat to your heart's content at The Mill's bountiful buffet. I daresay the spread's anything but run-of-the-mill. Seating within the spacious, warmly lit outlet is well-spread out and cloistered in the many nooks and corners so you'd never feel claustrophobic when The Mill gets busy. Of course, the centre of attraction here is its elongated open kitchen that enables a dedicated team of chefs to cook up a storm whilst doubling up as a display counter that's laden with the fruits of their labour. To welcome the Year of the Rabbit and in true muhibbah spirit, executive chef Tan Tik San has wisely conjured up a revamped menu that would appeal to all food-loving Malaysians, regardless of their ethnicity. So you'd find all the requisite condiments to toss up your own Yee Sang, Dim Sum and other Chinese dishes alongside piquant Indian Curries, Satay and assorted Asian specialities in the new line-up. 1. Go slow - survey the offerings available beforehand and let your eyes savour the visual feast. Eat slowly to really appreciate each dish's nuances and the efforts that have gone into making it. 2. Be selective - choose dishes that you usually won't cook at home or those that demand painstaking preparation, rare/seasonal ingredients or the chefs' expertise. 3. Don't bite off more than you can chew - take dainty portions of different specialities for sampling. This way you'd enjoy a greater variety. If you truly like a particular offering then go for additional helpings later. My choice picks from the salad and appetiser section include Poached Prawns, Fresh Scallop and Oysters served in their half shells; Smoked Duck Breast, Smoked Salmon, Asparagus & Carrot Salad and Mixed Lettuce with French Dressing. The mildly briny duck breast was a good match with the crisp asparagus tips as did the succulent salmon. 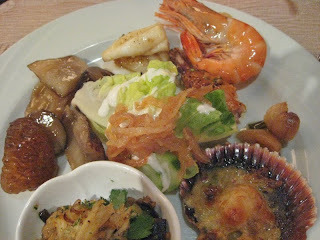 From the Japanese section, I sampled a delightful Tuna & Wakame (seaweed) Salad, some rustic Grilled Shiitake Mushroom and delectable Grilled Squid with Butter-Garlic Sauce. Besides Yee Sang, the Chinese section proffers Steamed and Fried Dim Sum, Fried Rice with Flying Fish Roe and a host of other goodies but I only had eyes for the Braised Sea Cucumber with Mushroom. Spongy yet slightly resistant to the bite, the plump pieces of sea cucumber went down a real treat. The Chicken with Mango & Chilli Sauce is not truly Chinese but hey, the tender meat was amply livened by the sweet-spicy sauce so we've no complaints there. Having OD on much Indian Muslim fare of late, I decided to forgo the Indian specialities this time around. Honestly, the Naan, Tandoori Chicken and various fiery-hued and well-spiced dishes look ravishing though. The dessert section is a virtual Mad Hatter's tea party as the wonderland of sweet treats range from Panna Cotta, Ice Kacang and Kuihs to Tong Shui, Chocolate Truffle Cake, Cheese Cake and Fruit Tartlets. Resistance is futile so I compromise by going for more fresh grapes and jackfruit, and dipped skewers of fresh strawberries into the flowing chocolate fountain. My other indulgences were a Mini Lemon Tartlet and a Chocolate Eclair. According to Amanda Teng, GMKL's asst manager of marketing, The Mill is expecting over 100 diners on CNY Eve and the turn-out is expected to rise further come the actual day. But fear not, the restaurant still has room to spare should you decide to join in the merry feasting. Items featured would be on rotational basis so diners will always find unexpected culinary surprises when they lunch or dine at The Mill from now until February 17. The buffet lunch is priced at RM65++ per adult and buffet dinner is at RM88++. For reservations, call The Mill, tel: 03-2117 4163/64. Gong Xi Fa Cai! May the Bunny Year brings success in leaps and bounds, filled with abundant feasting, merry laughter and good health for each and every one!